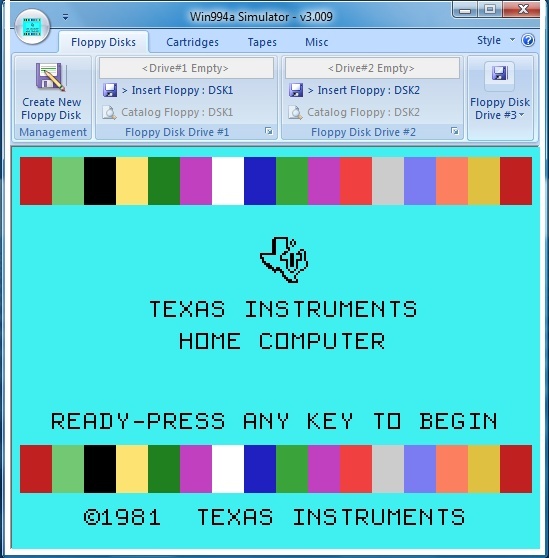 Win994a is a TI-99/4A simulator written by Cory Burr that installs and runs in the Windows environment. It was written to simulate the TI-99/4A, not to emulate it perfectly. 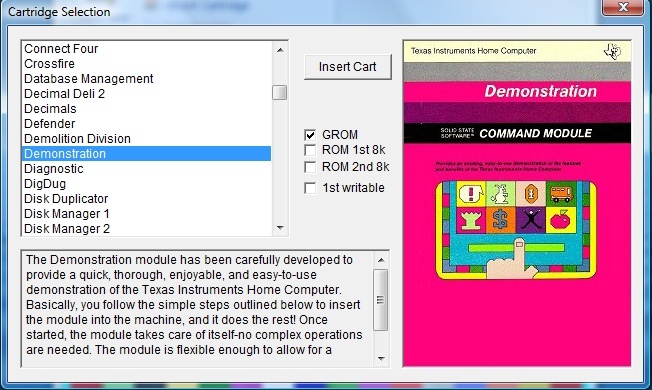 TMS9918a video chip functionality is fully implemented. TMS9919 sound chip functionality is fully implemented. TMS5220 speech synthesizer chip data transport is fully implemented. Speech text is displayed in a scrolling marquee, in addition to being spoken. Support for two external joysticks, or simulates one joystick input using numeric keypad. Runs over 200 cartridges correctly. Cartridges that depend on non-implemented CRU bits or non-documented video chip operation will fail. 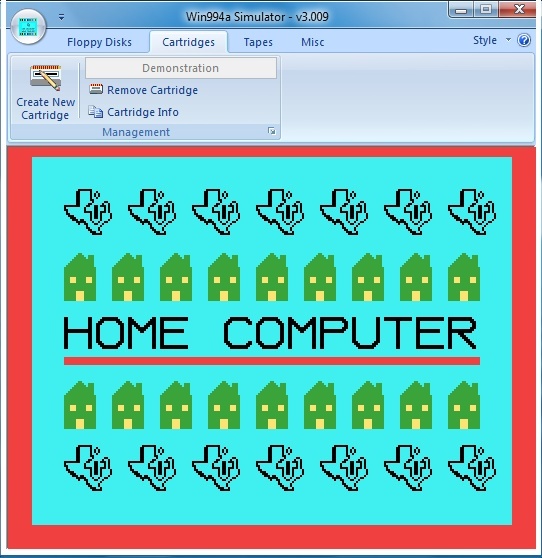 Other cartridges may fail due to bugs in the Win994a Simulator (major author apology). All TMS9940 CPU instructions are implemented. CPU clock ticks are accumulated for both instructions and fast/slow memory accesses. When enough clock ticks have been accumulated for 1/16 of a second real elapsed time, Win994a checks its high precision clock and gives up enough of the time slice so that accurate running time is maintained. TMS9918a: Uses DirectX for all operations. Video modes GRAPHICS, TEXT, MULTICOLOR, BITMAP, and BITMAP-TEXT are implemented. Sprites, sprite coincidence, screen blanking, and vertical interrupt operations are implemented. TMS5220: Speech synthesizer functions fully implemented. Speech text is displayed on a scrolling marquee in addition to being spoken. PIO and RS232 ports are supported, but using a different method than the original TI99/4a. PIO/1, PIO/2, RS232/1, RS232/2, RS232/3, and RS232/4 provide six separate pathways for making printouts through Window's print system. They do not provide input/output capabilities with the PC's actual hardware ports. Support for two externally connected joysticks, or simulates one joystick input using the keyboard numeric keypad. This version of Win994a is fairly light on changes. Mainly, these are technical internal modifications and most folks won't see any difference. The "X" (eXecute) cpu opcode has been modified to function correctly. In past versions, failure of this opcode caused several cartridges to malfunction, often resulting in crashes and Win994a reboots. Opcodes that set the "carry flag" were modified slightly. The Win994a Preferences Dialog has been modified to include a fast 16bit access 32K Extended Memory option. The Disk Manager application has virtually stayed the same. The assembler application has been revised and updated to correct a problem with the resulting machine code generated by a few conditional branch op codes. Note- cart/disk/cassette images are available in their own sections as single downloads for those with slower connections. For those with broadband, all of the images can be downloaded in single zip files from the main Win994a page. Please post any questions or comments here and perhaps other users can provide some assistance.